The illustration, a qualitative pool boiling curve, shows the dependence of the wall heat flux q on the wall superheat ΔT (the difference between the wall temperature and the liquid's saturation temperature). 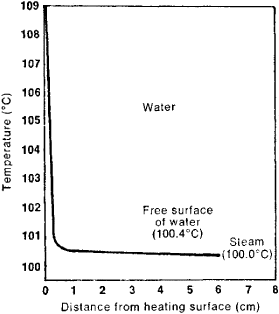 The plotted curve is for a horizontal surface underlying a pool of liquid at its saturation temperature (the boiling point at a given pressure). 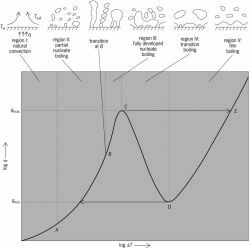 Several heat transfer regimes can be identified on the boiling curve: single-phase natural convection, partial nucleate boiling, fully developed nucleate boiling, transition boiling, and film boiling. Forced flow, both external and internal, greatly changes the boiling curve in the illustration. The heat flux is increased by forced convection at temperatures below boiling inception, and after that the nucleate boiling region is extended upward until a flow-enhanced higher maximum flux (corresponding to point C) is achieved. Forced flow boiling in tubes is used in many applications, including steam generators, nuclear reactors, and cooling of electronic components. the transition of a liquid into vapor, accompanied by the formation of bubbles of vapor, or vapor cavities, in the fluid. The bubbles result from the evaporation of the liquid within them and float to the surface, where the saturated vapor they contain passes into the vapor phase above the fluid. Boiling begins when the liquid is heated to the point at which the pressure of the saturated vapor above its surface becomes equal to the external pressure. The temperature at which a liquid starts to boil under a constant pressure is called the boiling point (Tb). Strictly speaking, Tb corresponds to the temperature of the saturated vapor (saturation temperature) above the plane surface of the boiling liquid, because the liquid itself is always somewhat superheated relative to Tb. For a steady-state boiling condition there is no change in the temperature of the boiling fluid. If the pressure is increased, Tb, rises. The maximum boiling temperature is called the critical temperature of a substance. The boiling point under atmospheric pressure is usually cited as one of the basic physicochemical properties of a chemically pure substance. To keep a liquid boiling, the heat that is expended in the formation of bubbles and in the work performed by the vapor against external pressure during the increase in volume of the vapor phase must be supplied. Thus, boiling is inseparably associated with heat transfer, which results in the transmission of heat from the heating surface to the liquid. The heat exchange during boiling is one of the forms of convective heat transfer. A definite temperature distribution (Figure 1) is established in a boiling liquid: near the heating surfaces (the walls of the container, pipes, and so on) the liquid is appreciably superheated (T > Tb). 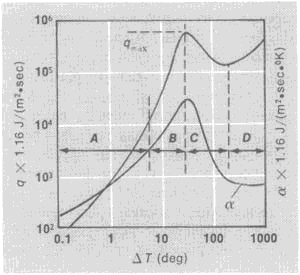 The degree of superheating depends on a number of physicochemical properties of both the liquid and the boundaries of the solid surfaces. Carefully purified liquids that are free of dissolved gases (air) can be superheated by dozens of degrees without starting to boil when special measures are taken. However, when such a superheated liquid finally begins to boil, the process occurs very violently, resembling an explosion. The onset of boiling is accompanied by spattering of the liquid, hydraulic shocks, and sometimes even the destruction of the container. The heat of superheating is expended in the formation of vapor, so that the liquid is rapidly cooled to the temperature of the saturated vapor, with which it is in equilibrium. The substantial superheating of a pure liquid without boiling is explained by the difficulty of formation of initial small bubbles (nuclei); their formation is hindered by the considerable mutual attraction of the molecules of the liquid. The situation is different when the liquid contains dissolved gases and various extremely fine suspended particles. In this case even very little superheating (by tenths of a degree) produces steady, smooth boiling because the initial nuclei of the vapor phase are provided by gas bubbles and solid particles. The principal centers of vapor formation are at the points of the hot surface where there are very small pores holding adsorbed gas, as well as various irregularities, inclusions, and deposits that reduce the molecular adhesion between the liquid and the surface. After a bubble has been formed, it grows only if the vapor pressure in it is slightly greater than the sum of the external pressure, the pressure of the overlying layer of liquid, and the capillary pressure, which is due to the surface curvature of the bubble. To create the necessary vapor pressure within a bubble, the surrounding liquid, which is in thermal equilibrium with the vapor, must have a temperature higher than Tb. This type of boiling, called nucleate boiling, is observed in everyday practice (for example, when water is boiling in a teakettle). It takes place when the temperature T of the heating surface is slightly higher than the boiling temperature—that is, when the thermal head ΔT = T – Tb is very small. As the temperature of the heating surface rises, the number of vaporization centers increases sharply and an increasing number of freed bubbles comes to the surface of the liquid, thus causing intense agitation. This results in a substantial increase in the flow of heat from the heating surface to the boiling liquid (a higher heat transfer coefficient α = q/Δ T, where q is the heat flow density at the heating surface; see Figure 2). The amount of vapor being created increases correspondingly. When the maximum (critical) value of the heat flow (qmax) is reached, a second, transitional boiling mode begins. In this mode most of the heating surface is covered with dry spots because of the progressive coalescence of the vapor bubbles. The heat transfer and the rate of vapor formation are sharply reduced because the vapor has a lower heat conduction than the fluid, and so the values of q and α are markedly lower. The boiling approaches a critical point. When the entire heating surface is covered with a thin film of vapor, the third, or film, boiling mode develops. In this mode the heat is transferred by heat conduction and radiation from an incandescent surface to the liquid through a film of vapor. The nature of the change in q upon transition from one boiling mode to another is shown in Figure 2. When the liquid does not wet the wall (as, for example, mercury and alloyed steel), boiling occurs only in the film mode. All three boiling modes can be observed in the reverse order when a massive metal body is immersed in water for quenching: the water begins to boil and the body is cooled slowly at first (film boiling), then the cooling rate begins to increase rapidly (transitional boiling) and achieves the highest values in the final stage of cooling (nucleate boiling). The heat transfer in the nucleate boiling mode is one of the most efficient means of cooling; it is used in atomic reactors and for cooling jet engines. Boiling processes are also used extensively in chemical engineering, in the food industry, in the production and fractionation of liquefied gases, and for cooling units in electronic apparatus. The mode of nucleate boiling of water is used most widely in modern steam boilers at power plants to produce steam at high temperatures and pressures. Film boiling in steam boilers cannot be tolerated, since it may result in over-heating of the tube walls and in boiler explosions. Boiling is possible not only when a liquid is heated under conditions of constant pressure. A decrease in external pressure at constant temperature can also cause a liquid to become super-heated and boil (because of a decrease in the saturation temperature). This explains, among other things, the phenomenon of cavitation—the formation of vapor cavities at low-pressure spots in a liquid (for example, in the turbulent area behind a steamship propeller). Boiling under reduced pressure is used in refrigeration engineering and in physics experiments. Radchenko, I. V. Molekuliarnaia fizika. Moscow, 1965. Mikheev, M. A. Osnovy teploperedachi, 3rd ed. Moscow-Leningrad, 1956. Chapter 5. The telescopic appearance of the limbs of the sun and planets when the earth's atmosphere is turbulent, characterized by a constant rippling motion and lack of a clearly defined edge. The transition of a substance from the liquid to the gaseous phase, taking place at a single temperature in pure substances and over a range of temperatures in mixtures. Both aqueous adhesives gave excellent performance in primary adhesion, boiling water resistance and hot oil resistance. The bulk of Boiling Point is made up of a long, detailed complaint about the economic condition of the middle class. This laboratory used the boiling method of analysis and felt the method obtained more consistent results with the larger sample. Just after boiling water was poured on coffee, the temperature was 92. These meals do not need refrigeration and can be easily prepared--you just drop the bag (or bags) into boiling water for 3 to 5 minutes and they're ready. PUT the egg in boiling salted water for three-and-a-half minutes. GS610(TM) has a maximum-tested Dry Boil Point or Equilibrium Reflux Boiling Point (ERBP) of 626 degrees F (330 degrees C) with a Wet Boiling Point or Wet Equilibrium Reflux Boiling Point (Wet ERBP) of 417 degrees F (214 degrees C) which also greatly exceeds the DOT 4 requirement of 311 degrees F (155 degrees C). When you empty a jar, refill it with boiling water and seal. Their answers ranged from boiling for 60 seconds to six minutes. Williams hypothesizes that the Wari made chicha by boiling the pepper-tree berries to extract the sugary exterior resin. Exabyte engineers, independent labs, and many customers have subjected VXA products to severe conditions, including violent vibration, immersion in volcanic dust, boiling water, hot coffee and soda -- even freezing them in solid blocks of ice. 120) Swedish scientists report finding "as much as 200 [micro]g/kg [of acrylamide] in mashed potatoes," while stating in a subsequent paragraph that boiling potatoes "appeared to generate none.